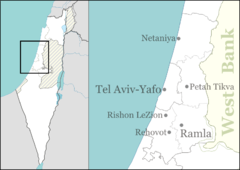 The 2002 Herzliya shawarma restaurant bombing took place on June 11, 2002 when a Palestinian suicide bomber set off a bomb at the Jamil (Mifgash Ha'Sharon) restaurant in the Israeli beach suburb of Herzliya. The event resulted in the death of one teenager, Hadar Hershkowitz, and the injury of 15 people. The attack led Israel to lodge a formal complaint with the UN security council, citing it as evidence for a "campaign of Palestinian terrorism" against Israeli civilians. At about 7:30 PM, a Palestinian suicide bomber set off a pipe bomb in the Shawarma restaurant "Mifgash Ha'Sharon" (AKA "Jamil"), where about 30 people were sitting. The pipe bomb used in the attack was said to have been "relatively small." A rescue worker said that one of the explosive devices the bomber was wearing did not detonate. According to Israel, the explosives had been packed with nails and ball bearings. A 14-year-old girl was killed in the attack and 15 additional people were injured in the attack. According to Israeli sources, earlier that day, three Israeli high school students were injured when Palestinian militants attacked their school bus. One student was seriously injured. That same day, a Palestinian militant stabbed an Israeli policeman in Jerusalem. Hadar Hershkowitz, 14, of Herzliya – the daughter of the director-general of the Hapoel Tel Aviv Football Club, Aryeh Hershkowitz. Hershkowitz was to have graduated from junior high school the next day. She was brought to hospital in a very serious condition, and later died from her injuries. The Al-Aqsa Martyrs Brigades, a military wing of Fatah, claimed responsibility for the attack, stating that it was "in retaliation for the daily incursions by the occupation forces against the cities, towns, villages and refugee camps". The Al-Aqsa Martyrs Brigades spokesman stated that the suicide bomber was a 30-year-old Palestinian named Omar Zayadeh who originated from the Palestinian village of Ma'adama in the West Bank. In 2003, Israeli troops demolished the home of bomber. According to Palestinian Media Watch, an Israel-based media watchdog organization, in 2010 the Palestinian Authority built a monument honoring the bomber in the town square of the West Bank town of Madama. The monument, in the form of a pyramid, features portraits of Yasser Arafat and of the bomber. Below the bomber's portrait are the words, "The heroic Shahada – Seeker (Martyrdom- Seeker) Omar Muhammad Ziyada (Abu Samed) who carried out the heroic Herzliya operation on June 11, 2002." Israel: David Baker, an official in Sharon's office, condemned the attack as "another example of the Palestinians' intention to commit murder for the sake of murder". Palestinian National Authority: PA officials condemned the attack, stating it was wrong to attack innocent people on the street. In the statement, the authority said it would do its "utmost" to prevent future attacks. Senior Hamas officials said the attack is "a natural response to Israel's crimes in the territories." ^ a b c d "PA town square memorial honors suicide terrorist and his attack as 'heroic,'" Itamar Marcus and Barbara Crook, August 19, 2002, Palestine Media Watch. ^ a b c Israeli complaint to the UN Security Council Archived 2012-10-21 at the Wayback Machine. 14 June 2002.